BEINN Alligin lifts itself out of Upper Loch Torridon with the casual assurance of a big beast among a clan of big beasts. With walls of bare striated sandstone and ridges that slice the wind, Alligin is a monument to brutal mountain architecture, eclipsed only by its immediate neighbour, Liathach. The sprawling Beinn Eighe, away to the east, completes the triumvirate. Some mountains are beautiful and serene but these three are menacing and hostile. They dominate and intimidate. If you like your uplands green and flecked with bleating sheep, steer clear of Glen Torridon because this is a land of fossilised dinosaurs of the stegosaurus and triceratops varieties. Big unfriendly giants . 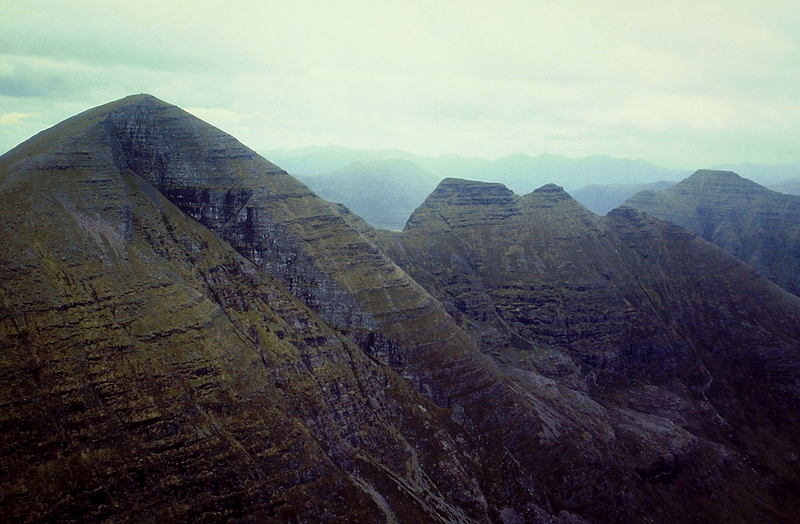 . .
Like a triceratops, Beinn Alligin possesses three horns. I don’t know much about them, or what to expect when I reach them, but after passing over the double summits of Alligin itself, I must negotiate Na Rathanan – the Horns of Alligin – before commencing my descent. It all sounds very unsettling. But when you’ve set yourself a target to climb every Munro (Scottish mountain in excess of 3,000ft or 914 metres), it’s no good bottling out on the big, ugly, dangerous ones. Today is a pleasant spring Wednesday with a cool wind streaming off the sea. I strike out across a broad moor towards a steep corrie called Coir’ nan Laogh. If I climb right up its middle it should deliver me to the first of Beinn Alligin’s twin peaks, the curiously named Tom na Gruagaich (922m or 3,025ft) which, my guidebook tells me, means peak of the maiden. It’s a long, steep and uneventful climb. Ha ha. Noddleheads. But at least this bright though blemished interlude has taken my mind off the muscle-burning tramp up the steep slopes of Coir’ nan Laogh. I stand on the summit of Tom na Gruagaich in a flood of crisp Atlantic wind. By God, this blows all traces of trepidation and fawning Daily Mail negativity from my head. 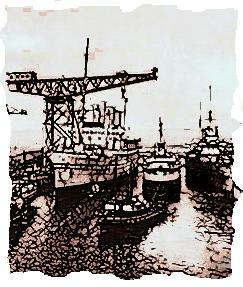 I can smell the sea and Hebridean heather; taste salt and bog flowers and the dampness of ancient rocks. I can see the massive bulk of Liathach and the vast hinterlands stretching wild and lonely into the north; and Alligin’s second and highest peak, Sgurr Mhor, with the deep black gash of Eag Dhubh scarring its front; and the Horns, the three mysterious Horns of Alligin, bristling like the arched spine of a stegosaurus and looking pretty damned formidable. This is turning into a good-to-be-alive day. The wind carries me to the top of Sgurr Mhor (986m or 3,235ft), carefully skirting the lip of Eag Dhubh, which looks for all the world like a doorway into hell – and probably is. Wouldn’t want to tumble in there and bounce to the bottom. From Sgurr Mhor I scramble east down a dip onto a windswept col – and the first of the Horns rises before me in successive bands of grey rock and wiry grass. It looks pretty bleak and menacing, but a ribbon of pathway snakes its way from my battered boots to the crest of the spine, and I follow it without deviation. On the top, relief and exhilaration. The ridge is wide enough to accommodate a decent track, which dips and lurches over the remaining Horns. This is spectacular walking indeed – a high-level spine of cracked crags offering spectacular views of Alligin, Liathach, and a bunch of stratified peaks to the north and east. All this and a glorious wind that smells of sea and distant places. Another faint path picks its way uncertainly down the rocky slope at the end of the ridge to join a stalkers’ path and a pleasant tramp to the road. I march along it in one of those thoughtful moods that descends upon mountain walkers at the close of an energetic and thoroughly satisfying day. 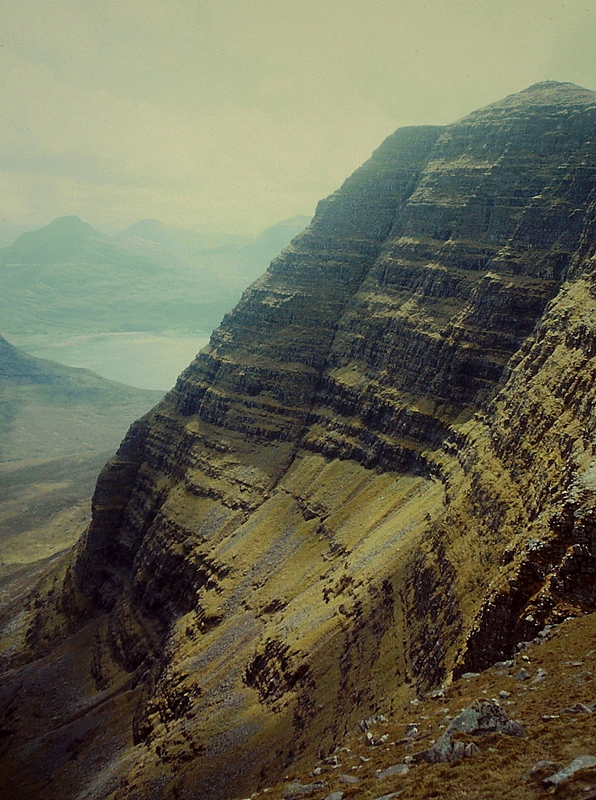 I decide that Beinn Alligin, with its impossible crags, deep deadly gashes and bristling Horns, is not as ugly and hostile as it initially appeared. There is a stark beauty in its sandstone architecture and a friendliness that comes with familiarity. 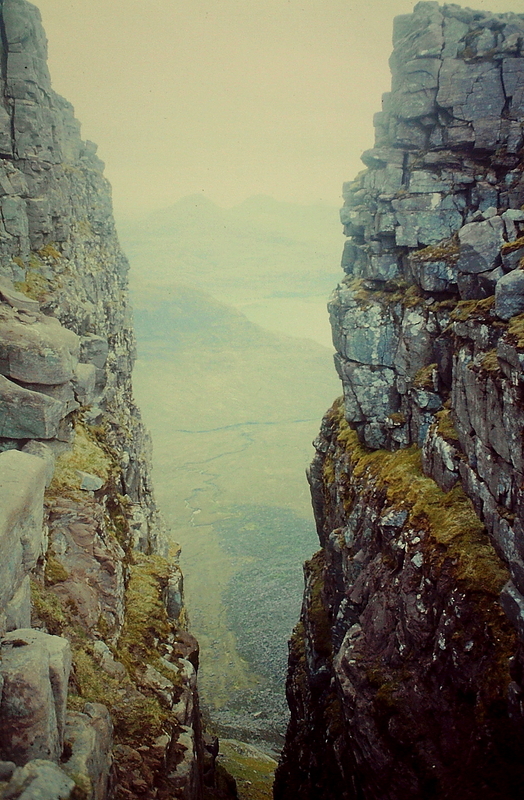 Perhaps I’ll feel the same about Liathach one day. That remains to be seen. This entry was posted in Camping, Climbing, Environment, Fish and chips, Footpaths, Geology, Hiking, Mountains, Walking, Weather and tagged Munros, outdoors, Scotland, The Munros, WPLongform. Bookmark the permalink. Hey! we all read the Daily Mail Online at work – can’t stand the bias of the BBC website nowadays… That chip fryer scene was actually truly horrific (although Spooks was generally excellent in the first few series) and still haunts me to this day. It’s easily the worst thing I’ve ever seen and that includes the ‘real-life’ stuff in the news. Hi Carol. The Daily Mail always make me laugh in places it’s not supposed to. It gets outraged over all the wrong stuff. I was going to include the video of Kenneth Williams meeting his end in a deep-fat fryer but didn’t for fear of upsetting people. It’s on YouTube and only lasts four seconds. I thought, overall, Beinn Alligin was a great mountain, and the Horns path was not nearly as “exposed” as my guidebook led me to believe. Certainly worth a day out – but you need the weather, if only for the views. I don’t think the Carry On scene would outrage anyone as it was obviously light-hearted but that other scene truly was horrendous and I don’t think it should have been shown. It’s a wonderful area. 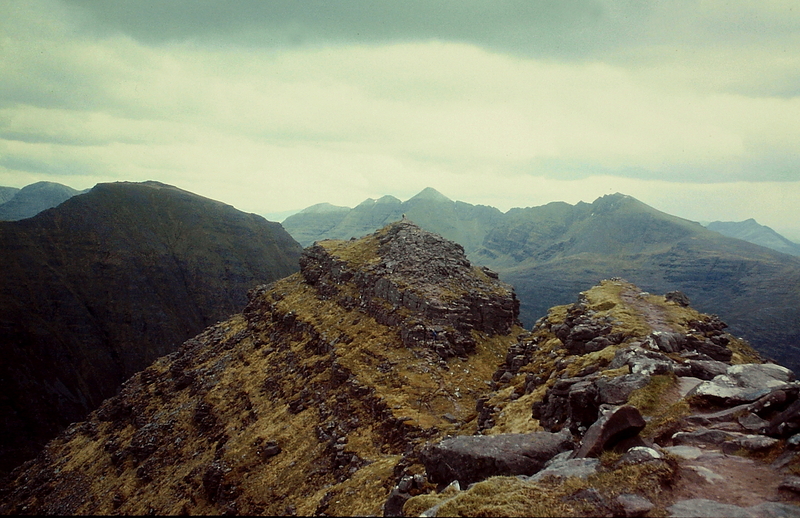 I had a plan to do some backpacking up behind Liathach in that group of hills but nothing ever came of it. 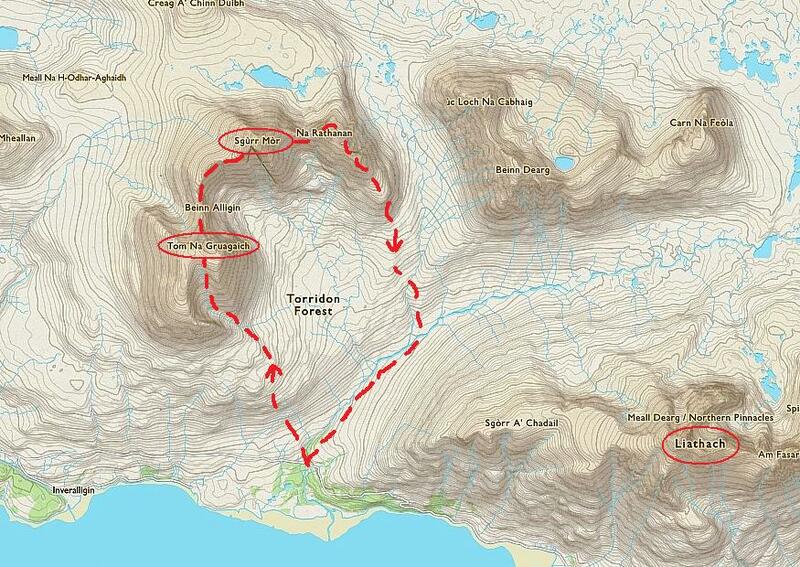 I actually don’t like Torridon much – probably because it’s such a ‘fierce’ area. I’d like to walk the through route behind the main hills though. Last night I was racking my brain for adjectives to describe Torridon and I missed “fierce”. That is perfect. I’ll use that next time round. I’ll draw a veil over the offensive, gratuitous TV nonsense if I may, and think about Beinn Alligin instead. 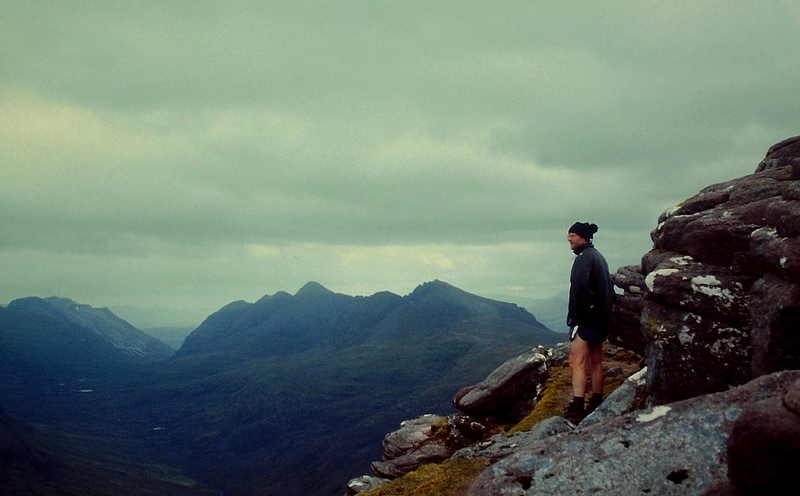 A few (quite a few) years ago my friend Tim and I drove up to Torridon for a long weekend of Munro-bagging. As we set up camp the weather was glorious – wall to wall blue sky and not a breath of wind. The midge candle flames stood straight up it was so still. Next morning we woke to the unbelievable sound of torrential rain on the tent but we set off for Beinn Alligin regardless (we were keen fell runners back then and a bit of rain wasn’t going to dissuade us). We did the whole route (virtually the same route as yours Alen) in sluicing rain that ran up our sleeves whenever we reached up for a hand hold on the steep bits but we found it strangely exhilarating. On the plunging swooping descent of Na Rathanan’s SE ridge we revelled in the Torridon sandstone terraces, which were streaming with water but still “Mr Grip” as Tim said. Had it been limestone we’d have had to crawl..
Hola, Andy. That’s a great account. I think, under those circumstances, I would have opted for a Plan B rather than set out for Beinn Alligin and the Horns, something less challenging to the south of Loch Torridon such as Maol Chean-Dearg and its surrounding hills. Having said that, the day after my Alligin trip I did the Beinn Eighe Munros in torrential rain, though it was quite pleasant when I set out. I ascended the front of Spidean Coire nan Clach and just reached the top when the heavens opened. The rest of the day, Ruadh-stac Mor and down to Coire Mhic Fhearchair, was spent weaving in and out of heavy showers that merged into a continuous deluge as the day progressed. It must be something about Torridon. I drove up there in brilliant sunshine, too. The rain seems to matter less when running as it’s all about the physical action. The environment (whatever it is) becomes an integral part of the physical experience. I’ll go along with that. What I can’t get my head round is how you can “run” over a rocky great lump like Beinn Alligin without falling off. 🙂 Well, there’s a certain amount of poetic license in the term “fell running”… On Beinn Alligin we did spend a lot of time clambering, scrambling and – dare I say it – walking! Basically just ambulating by whatever means seemed appropriate at the time. Scottish mountains are very good at puncturing an average fell runner’s conceit. Outstanding read and pictures, Alen. Intimidating mountains as Beinn Alligin is like a mirror without wrapping. The mountain challenges and rewards: The pleasure and satisfaction of the ascent of one of the true jewels of the north west as they say in the UKH. I love to get above the tree line, as long as I can still hear the bell from the ewes. Hi Hanna. Thank you for that wonderful comment. You are very kind. The pictures were taken on either Kodachrome 64 or Ektachrome 200 slide film, I can’t remember which, and converted to digital last week. They inevitably lose a degree of quality during the conversion process, which I try to regain with a bit of editing, but they are not as sharp as the original slides. You make me laugh with your hearing the bell from the ewes. I can hear bells on the goats here twice a day. PS What is the UKH? Was that a slip of the fingers or have I missed something? image composition supports your wonderful epic tale. A wonderful read and pictures, thank you. Hi John. Thanks for that. I thought the first picture was dramatic enough until I saw the picture of Eg Nog (what was it… Eag Dubh). Fierce is a great word for mountains like these, they teach you respect. And it’s true, you do come down in a thoughtful mood after a day on the tops. Hi Chris. I like the sound of Eg Nog. Apparently, Eag Dhubh translates as black hole or black gash,or something like that. You can bet your life that if ever it comes up in a future conversation, I’ll accidentally call it Eg Nog. Hi Putri. Thank you for your comment. I am glad you like the scenery. I also have a fear of heights.